Need a break? Dive into a book! 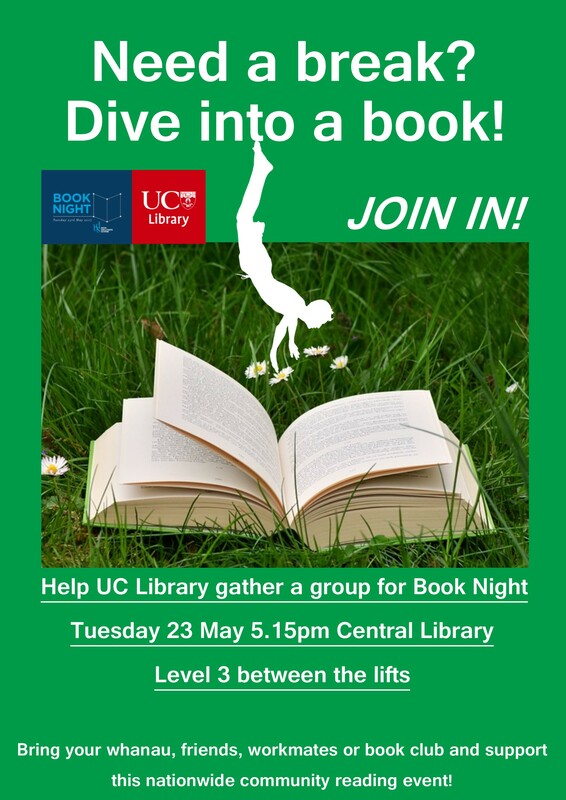 Help UC Library gather as many people as we can for Book Night 2017! Bring along your whānau, friends, workmates or book club and support this nationwide event. 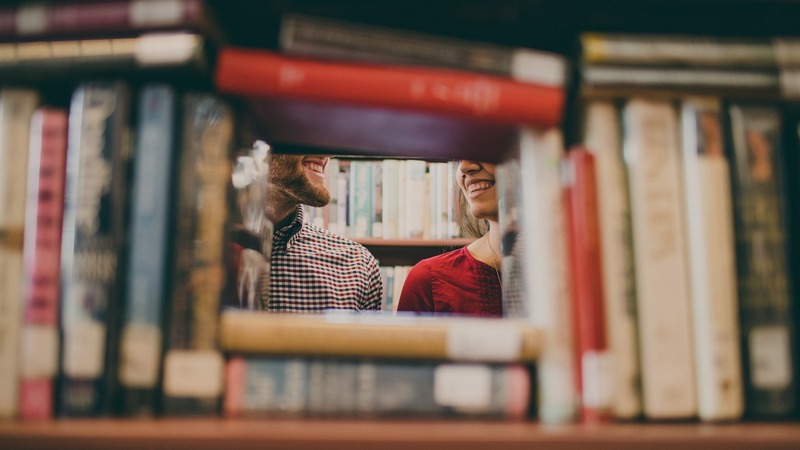 Bring your own book or choose something from our display of recreational reading material. Meet between the lifts on Level 3 of Central Library at 5:15pm Tuesday 23 May. 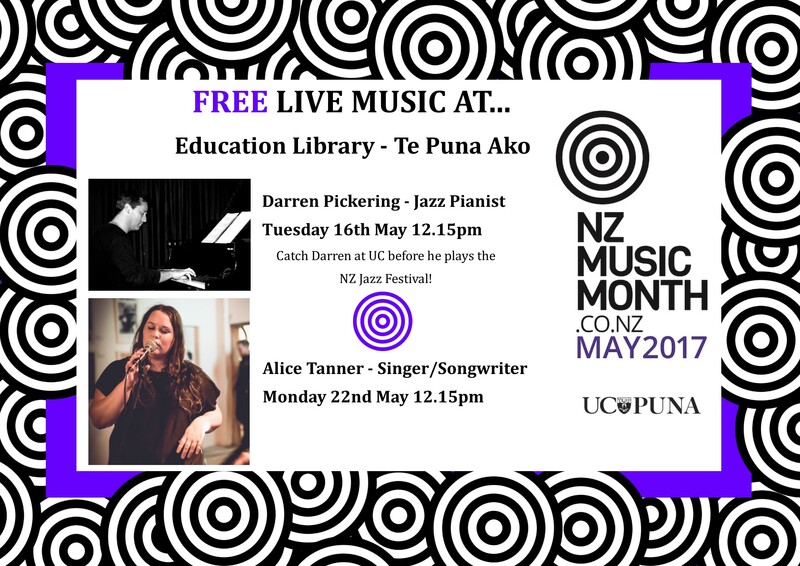 UC Library is proud to present two special lunchtime music performances inside the Education Library to celebrate NZ Music Month. Darren has taught in schools in London and Cairo as well as performed internationally, including at jazz festivals in Cyprus and Lebanon. He is a regular performer at jazz festivals throughout Aotearoa New Zealand, including the upcoming New Zealand Jazz Festival this May, where he will play with Oval Office, the Symposium Big Band and in a duo setting with vocalist Kate Taylor. Darren’s keyboard, piano playing and compositions also feature on numerous studio albums across many genres – the latest albums he plays on include the recent releases by both Shapeshifter and Pacific Heights. We are incredibly lucky to have Darren playing solo piano live in the library ahead of his New Zealand Jazz Festival performances. On Monday 22 May we are hosting singer/songwriter, composer and musician, the multi-talented and very lovely Alice Tanner. Alice is a professional singer performing around NZ. She performs in many groups, including cover bands, jazz bands, duos, original bands and also solo. Alice studied at CPIT Jazz School and has a Bachelor of Musical Arts majoring in Jazz Vocals. A classical background in both cello and piano means she is a well-rounded musician with a breadth of knowledge in different styles and genres. Alice will be performing a mixture of covers, originals and jazz standards for her performance in the library. Both performances are free, so bring your lunch and come along for some live music in the library, this NZ Music Month. Darren Pickering: Tuesday 16 May, 12.15pm – 12.55pm. Alice Tanner: Monday 22 May, 12.15pm – 12.55pm. Te Puna Ako – Education Library, Dovedale. Students frequently tie themselves up in knots trying to figure out what they have to reference and how. As we approach peak assessment time, we’ve dedicated a whole week to offering APA referencing workshops, providing exemplars on Facebook and Twitter, and highlighting the plethora of resources and services the Library offers to help them perfect their in-text citations and reference lists. We’d appreciate if it you could share this info with students – hey, it might reduce the pre-assignment questions!